Heat oven to 450°F. Grease square pan, 8x8x2 inches. Cook beef and taco seasoning mix as directed on envelope of seasoning mix. Mix Bisquick mix and cold water until soft dough forms; spread in pan. Spread beef mixture over dough. Bake uncovered 25 to 30 minutes or until edges are golden brown and toothpick inserted in center comes out clean. Immediately sprinkle with cheese. Let stand 1 to 2 minutes or until cheese is melted. Serve with remaining ingredients. More zip? 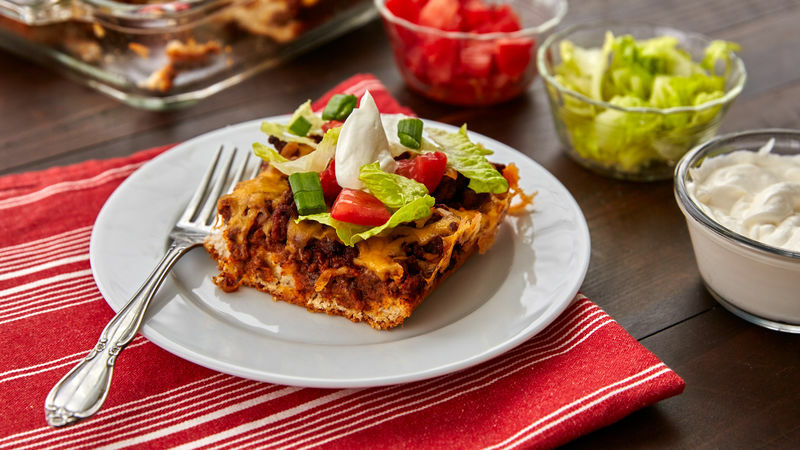 Use shredded taco-seasoned cheese or Monterey Jack cheese with jalapeño peppers to boost that great Southwest flavor!